H 7530, "Residence of Those in Government Custody Act", introduced by Representatives Williams, Ajello, Ranglin Vassell, Perez, and Slater, February 9, 2018. And S 2267, "Residence of Those in Government Custody Act", introduced by Senators Metts, Jabour, Quezada, Crowley, and Nesselbush, February 01, 2018. 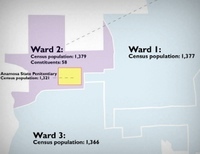 Unlocking the Census: Nearly 5000 “Guests” should not prop up Cranston districts, by Bruce Reilly, RIFuture.org, January 13, 2010. Bruce Reilly looks at the impact of prison-based gerrymandering on individual districts — and democracy as a whole — in Rhode Island. Activists: 'Prison-based gerrymandering' dilutes urban powerby Matt O'Brien and Susan Haigh, Associated Press, February 19, 2016.